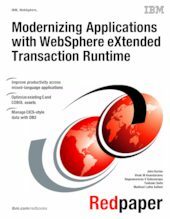 IBM® WebSphere eXtended Transaction Runtime V2.1 is an addition to the IBM Transaction Processing capabilities. This product provides a fast, scalable, and reliable transaction processing experience. Many customers have invested much time and effort in the development of business logic in CICS® style COBOL and C applications and are looking to unlock the value of those applications and extend them by using Java EE. This paper helps you explore this product and provides information that helps you host your CICS style COBOL and C applications on a WebSphere platform. This paper also provides you with a detailed step-by-step approach for modernizing your existing Tuxedo-based applications through a migration to WXTR. This paper is intended for developers and architects who want to extend and reuse their CICS style COBOL and C applications.